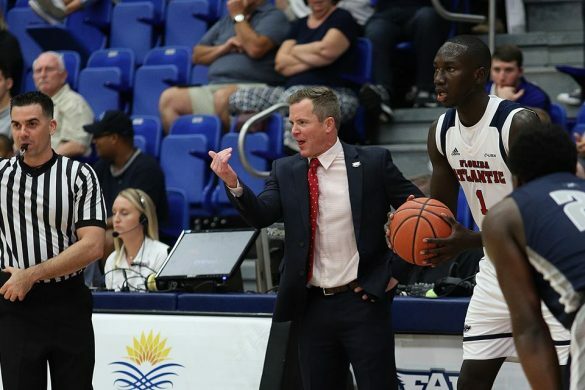 BOCA RATON – For the first time during the Lane Kiffin era, FAU heads into a Saturday having lost to a Conference USA team. 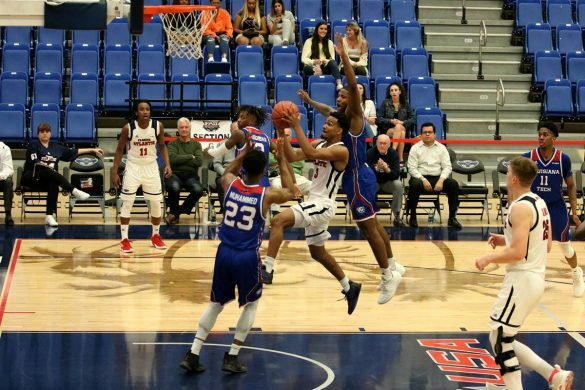 The Owls’ stinging final-minute loss to MTSU on Saturday snapped Kiffin’s and the Owls’ nine-game winning streak against C-USA teams. The loss exposed what most who follow the Owls already understood: The 2018 football Owls are not the same team that won the 2017 Conference USA title. This version of the Owls still have flaws, and they are becoming increasingly difficult to fix. Re-opening the quarterback battle appeared to be a possibility earlier this week, though that talk died down as the week progressed. 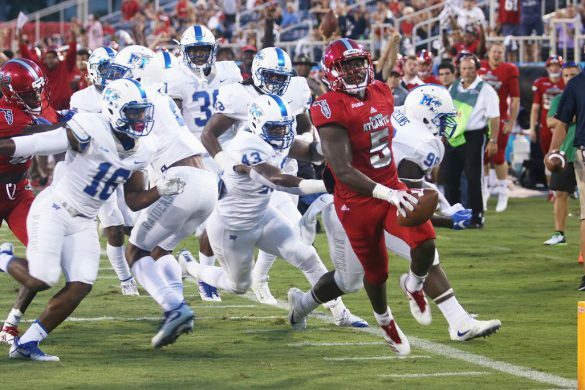 FAU players admitted they let up against the Blue Raiders, and that complacency led to the offensive downfall. How do the Owls fix these problems? Those are two of the topics discussed on this week’s OwlTalk with Brian Rowitz. 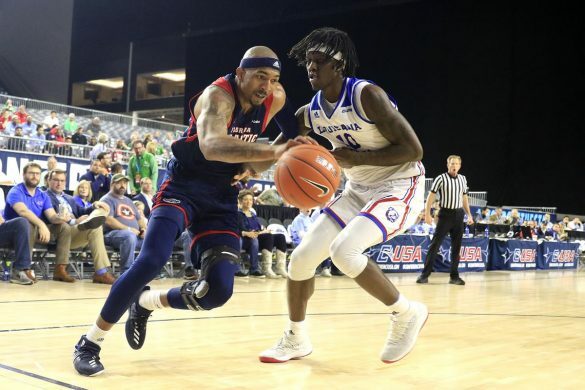 Also this week, Rowitz and our Chuck King address FAU’s improvement on defense, some of the controversial calls against MTSU and the current state of Conference USA. Rowitz, an ESPN West Palm host, then turns his attention to an ODU team that’s been difficult to figure out this season. The Monarchs own only one win, but that came against Top 25-ranked Virginia Tech after ODU made a change at quarterback. 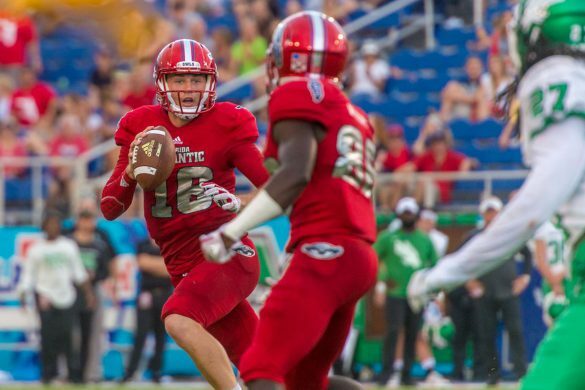 What does FAU need to do to notch its first C-USA victory of the season? Is this the game that the FAU deep passing threats finally experiences success? And can the Owls rebound from a conference-opening loss to repeat as C-USA champions? 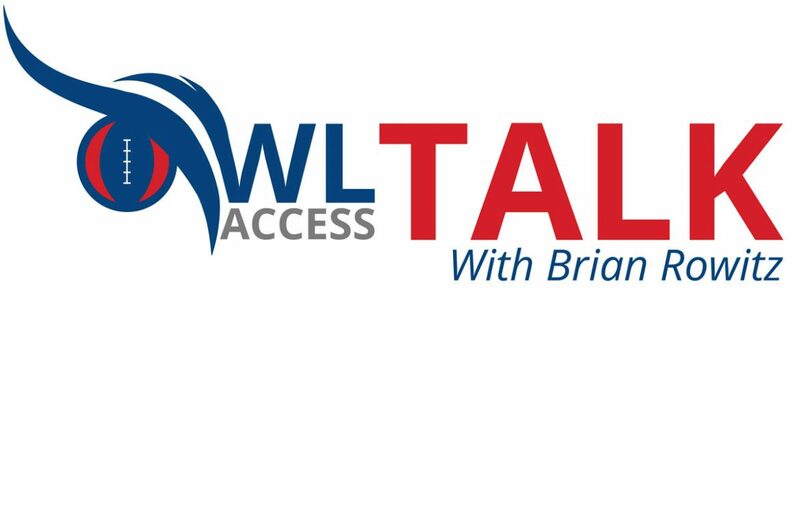 All of those questions and more are answered in this week’s OwlTalk FAU football podcast. So take a few minutes to stick OwlTalk in your ears. It will make you a better fan. BOCA RATON – On Friday afternoon, less than 24 hours before FAU’s scheduled kickoff against Air Force, safety Da’Von Brown and his teammates received their first look at the Owls’ newly renovated locker rooms. 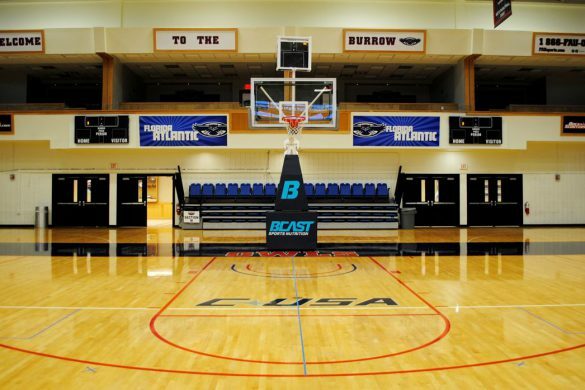 “That’s the best locker room I’ve ever seen,” Brown said. That reaction wasn’t unique to Brown. 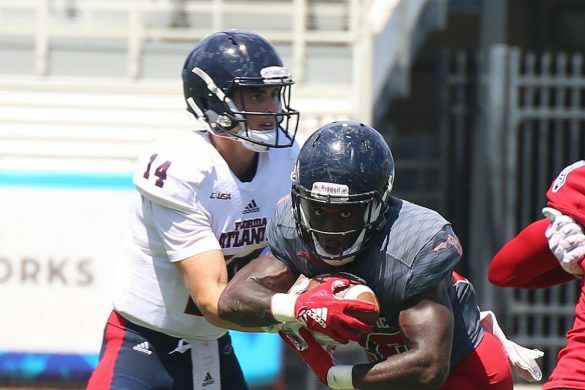 Running back Devin Singletary saw a locker room that showed FAU is developing into a first class program. 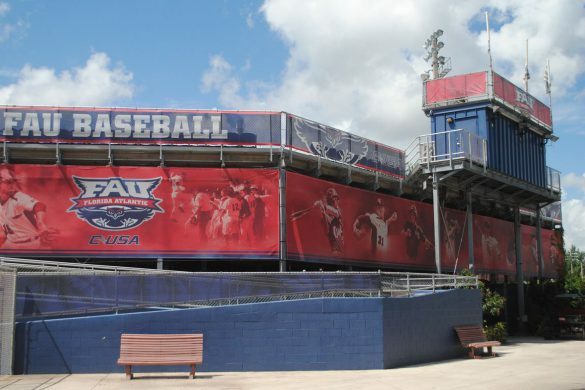 FAU’s stadium opened in 2011, but the Owls’ program already outgrew their locker room facilities. The renovations are part of the forthcoming Schmidt Athletic Complex, most of which will be located on the lawn west of Howard Schnellenberger Field. As part of the upgrades, the Owls enlarged the locker room, added better training facilities and even created a small player lounge complete with a television and foosball table. 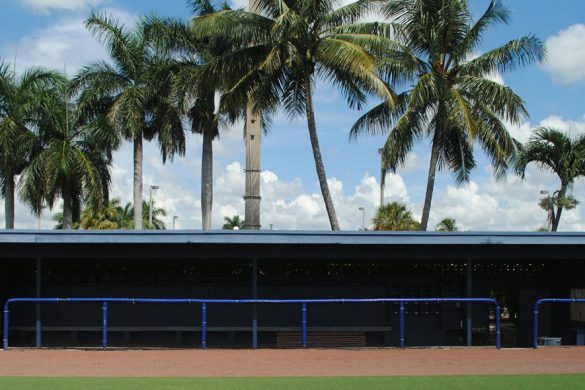 To make room for the larger locker room and training facilities, FAU did away with some of the coaches’ meeting rooms, dressing rooms and the recruiting room, which will be relocated to the new Schmidt Complex. Once the Schmidt complex opens, the stadium locker room will be the only one the football team uses. At the moment they are housed in the Oxley Center and practice on the fields out back. The Schmidt Complex will be the new home for the football offices and will feature their own practice fields. The second phase of the program, one that has been de-emphasized over the past year, will add an indoor practice facility. 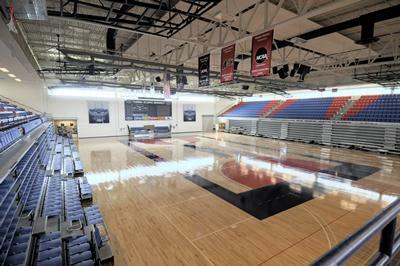 The area within the Stadium housing the hydrotherapy tubs and underwater tread mill remains the only incomplete portion of renovations. Those facilities are expected to come on line in the coming weeks. When complete, the Schmidt Complex will also house a new weight room, academic services, an athlete lounge and other amenities. 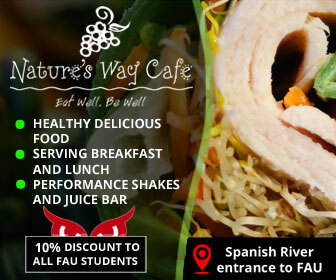 FAU has not announced a time frame for the project’s completion. 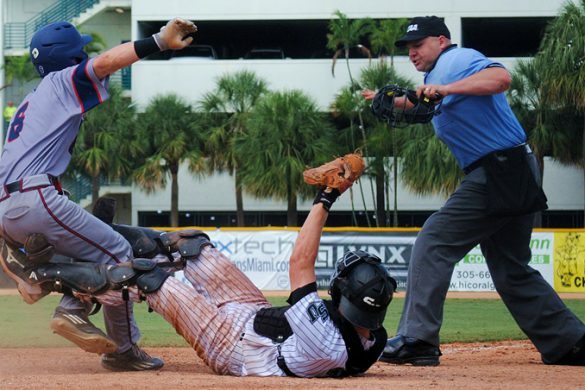 BOCA RATON – It’s been a dominating week for FAU. The Owls crushed Akron 50-3 in the Boca Raton Bowl. Shortly before the game coach Lane Kiffin and FAU President Dr. John Kelly agreed to extend Kiffin’s contract to keep him in Boca Raton until 2027, though all details of the contract other than the length have yet to be worked out. Kiffin then immediately began creating more enjoyable surroundings, signing a handful of recruits – some of whom should be able to make an immediate impact. 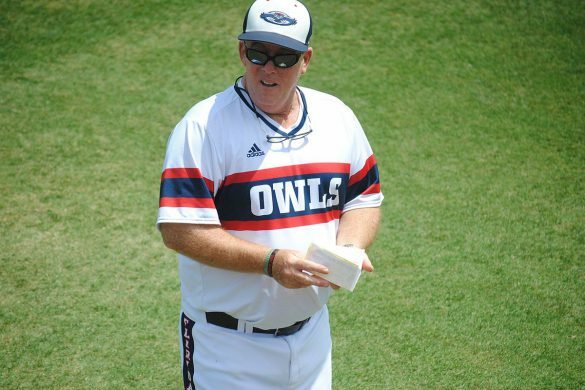 But before looking too far ahead, what to make of this year’s FAU Owls? Which unit surprised more this year, a dominating offense or a suddenly stingy defense? What should FAU fans make of the Owls’ recruiting efforts that led to five additions on early signing day? And is it too early to discuss a 2018 quarterback battle that will be led by a signal caller who enters the offseason having piloted the Owls to 10 consecutive wins? All of those topics are addressed on the season-finale edition of OwlTalk with Brian Rowitz, the first and still finest FAU football podcast. 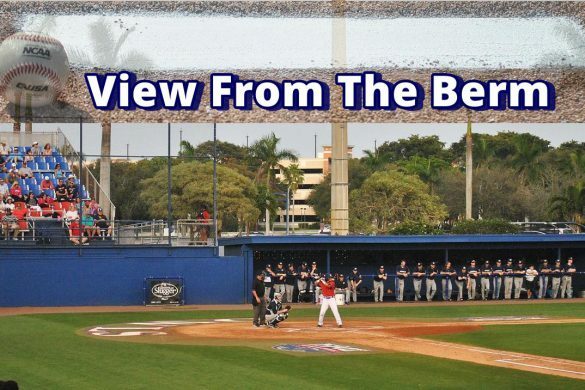 ESPN West Palm’s Rowitz and our Chuck King also discuss a transformational season for FAU football and look ahead to what FAU fans can expect from the Owls moving forward. So take a break from holiday shopping or those last minute work projects that need to be completed before Christmas break and revel in FAU football’s best season ever. Trust us, listening will make you happy. It is, after all, the most wonderful time of the year. 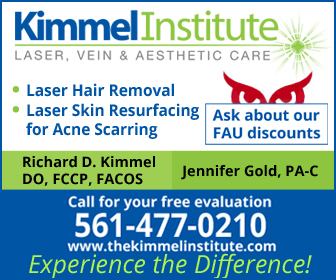 BOCA RATON – FAU president Dr. John Kelly offered a relatively simple explanation why he began talking with first-year coach Lane Kiffin about a contract extension. “I didn’t want to lose Lane Kiffin and I think today proves why we didn’t want to lose him,” Kelly said shortly after the Kiffin-led Owls thrashed Akron 50-3 in the Boca Raton Bowl to complete Kiffin’s inaugural year with an 11-3 record. A few hours before kickoff of the Boca Raton Bowl news of Kiffin and FAU reaching a contract extension that will tie the coach to Boca Raton until 2027 flooded the internet. Terms of the contract have not been released because, well, there are no terms yet. The two sides agreed on the length of the deal but none of the other specifics, such as compensation, bonuses or out clauses. “Still have to work out some details but it will be easy now,” Kelly said. The extension agreement came less than 24 hours before the start of football’s first early signing period. The extension, when signed, would give Kiffin a weapon to deploy against rival coaches who try to dissuade recruits from signing with FAU by telling them Kiffin will soon leave Boca Raton. Kiffin signed a five-year contract contract worth $950,000 per year a little more than a year ago. 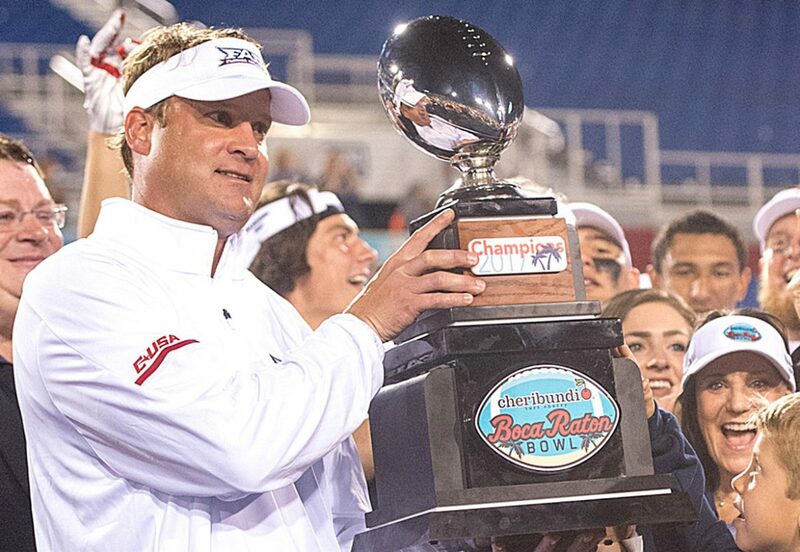 The 11 wins during his first season make Kiffin the second-winningest coach in program history. Late in the blowout of Akron, fans behind the FAU bench began chanting “10 more years!” at Kiffin. The chant resumed at midfield when Fans stormed the field following the victory. TURNING POINT: FAU moved the ball well yet still only led 14-3 with less than 2 minutes remaining in the first half when the Owls took over possession at their own 13. Rather than kill the clock, quarterback Jason Driskel found Kamrin Solomon with a deep ball that covered 63 yards. Three plays later Devin Singletary broke into the end zone, sending FAU into half up 21-3 and breaking the spirits of the Zips. 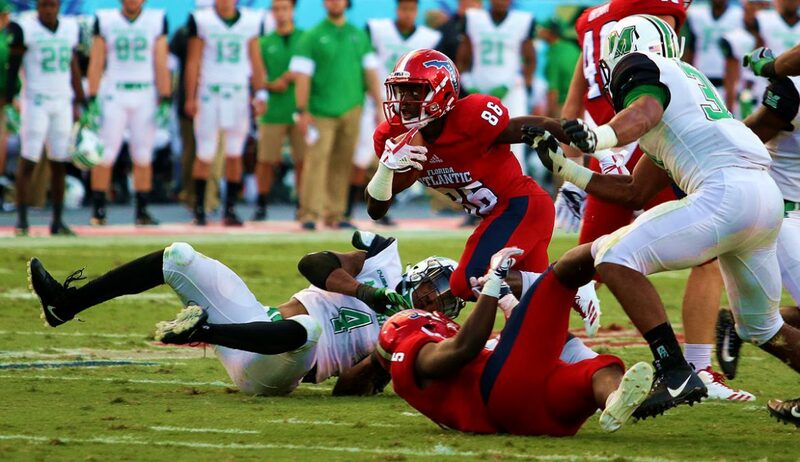 DeAndre McNeal started the year as FAU’s go-to wide receiver, but the former Texas Longhorn disappeared late in the season. He missed the regular season finale at Charlotte and the C-USA title game after suffering a concussion. Scheduled to return for the Boca Bowl, McNeal injured his ankle during pregame warm-ups and emerged from the locker room prior to kickoff walking with the aid of crutches. He never saw a snap. 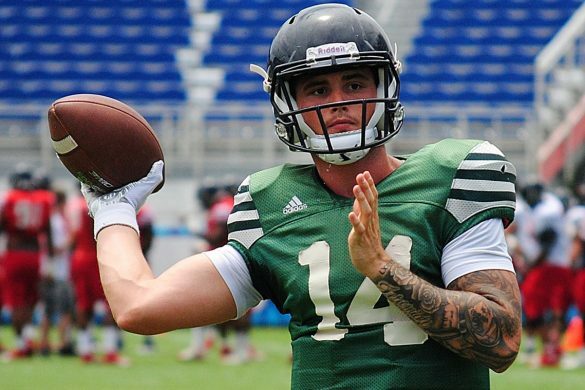 FAU will quickly pivot from an on-field challenge to one off the field. 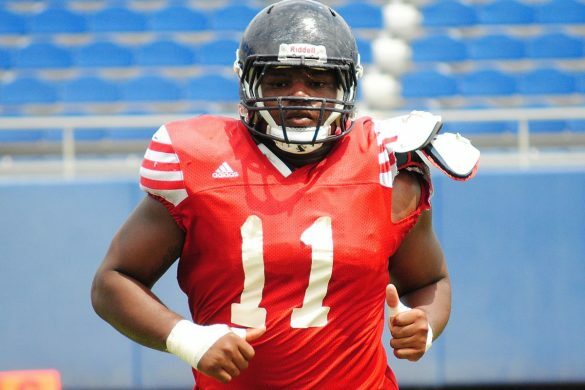 The Owls will likely sign at least five and as many as eight recruits on Wednesday, the initial day of the first-ever football early signing period. 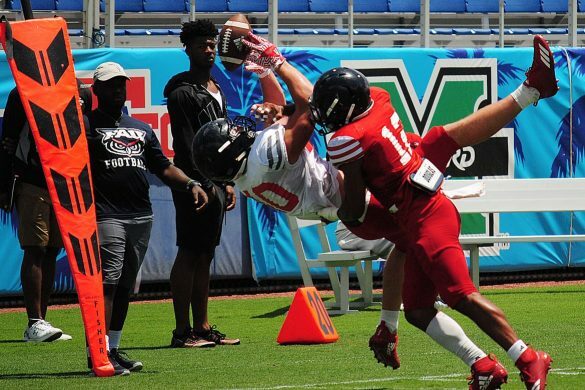 On Tuesday, former Mississippi St. cornerback Chris Stamps became the latest player to commit to FAU. 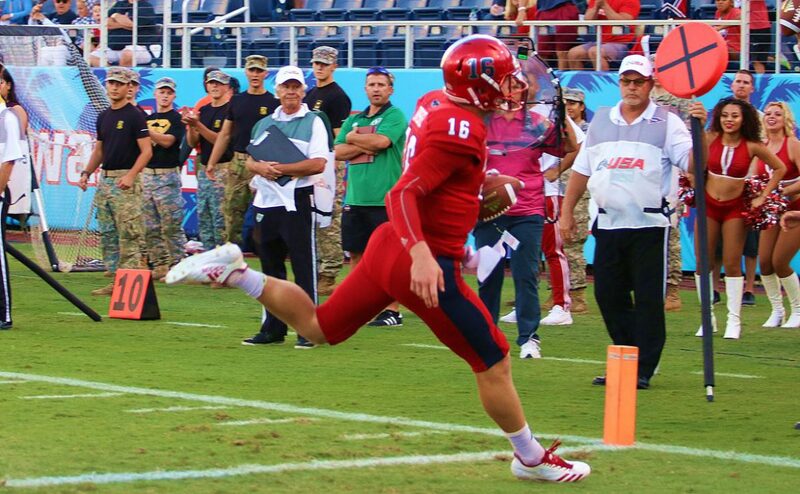 1 – Punt for FAU. It didn’t come until the fourth quarter. 5 – Fourth down conversions on six tries for FAU. Three were touchdowns. 6 – Sacks on the season for Hunter Snyder and Rashad Smith, to lead the Owls. Snyder recorded 1.5 on Tuesday while Smith had one. 7 – Catches for 71 yards by Willie Wright. His two touchdowns gave Wright six on the season – tops among Owls. 13 – Tackles for Azeez Al-Shaair to lead the Owls. He now has 354 over three years. 44 – Yards of total offense for Akron in the second half. 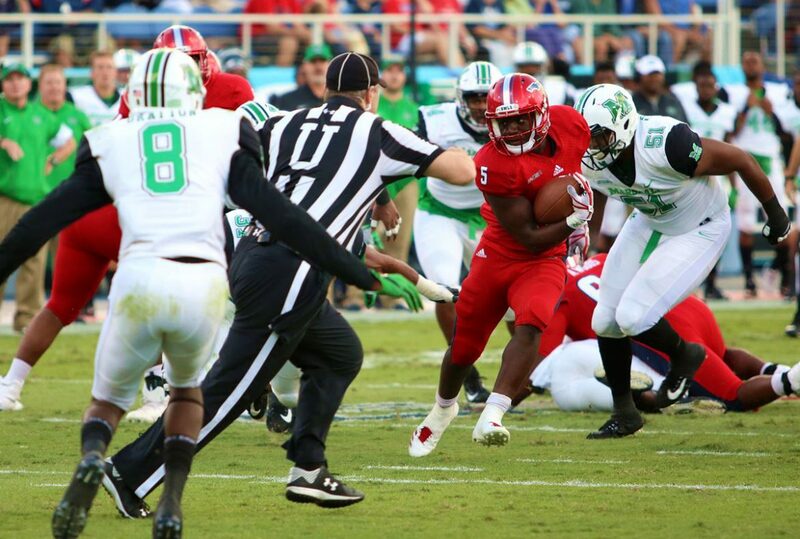 52 – Rushing touchdowns for FAU this season, setting a new Conference USA record. 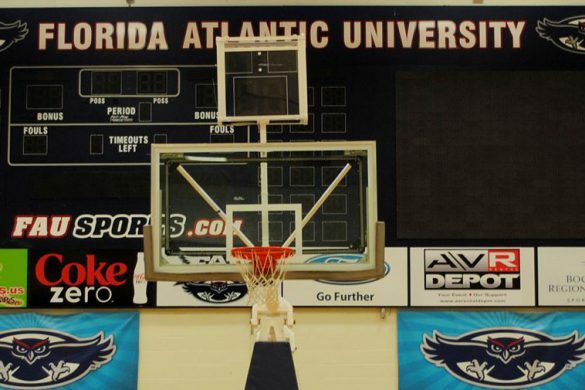 190 – Points scored by FAU in the first halves of the Owls final eight games. They only allowed 59 first-half points during that span. 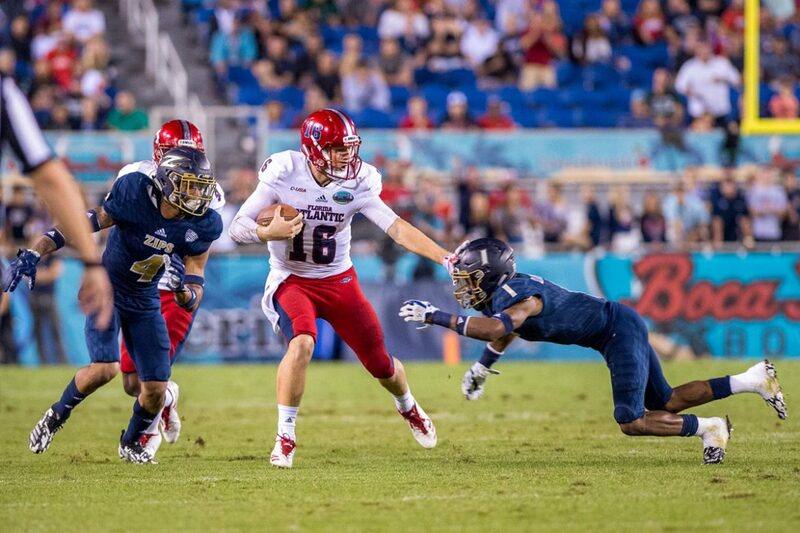 582 – Yards of total offense for FAU against Akron. The Zips only managed 146. 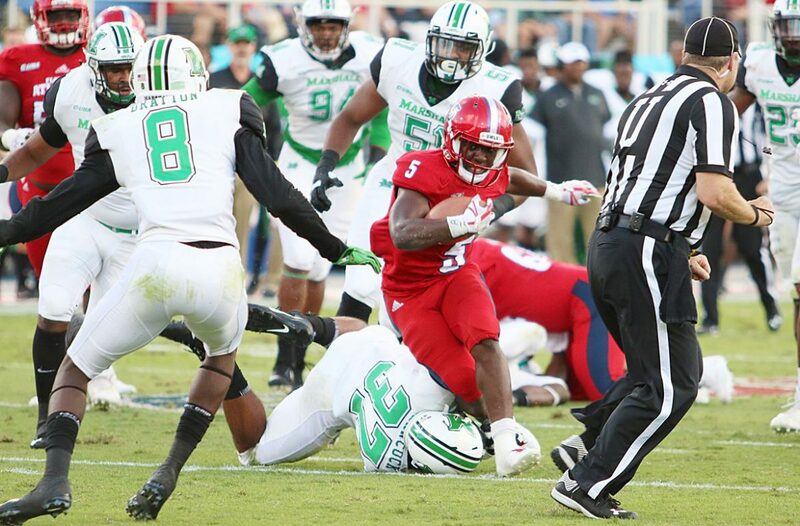 3,586 – All-purpose yards for Devin Singletary in his two year career, second-most all time at FAU. UP NEXT: FAU’s season is complete. FAU won’t learn until after the conclusion of the NCAA football playoffs whether it will end the season ranked in the Top 25 for the first time in program history. 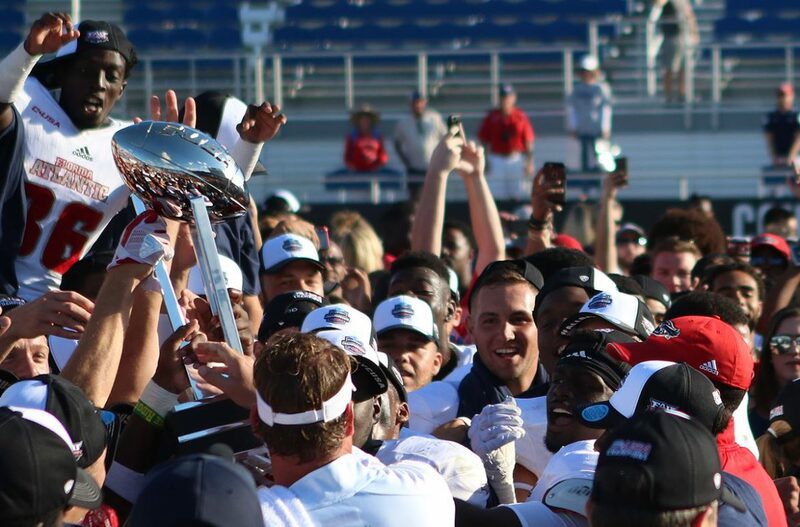 BOCA RATON – For the third time in as many games at Howard Schnellenberger Field, FAU students rushed the field to help celebrate a trophy claimed in blowout fashion. 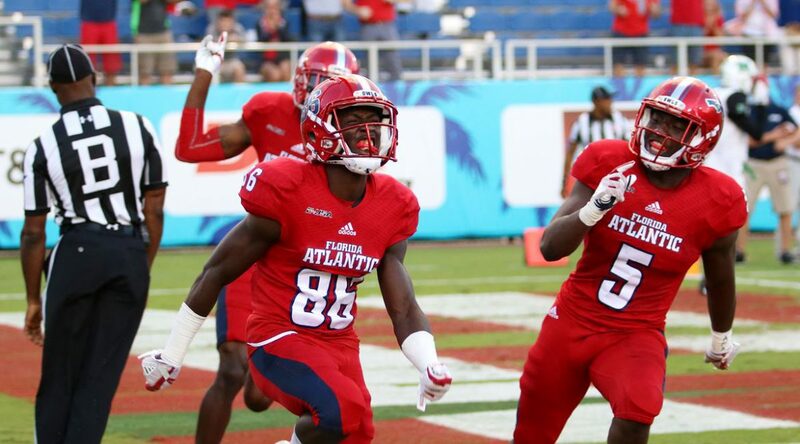 FAU completed a dream turnaround by crushing Akron 50-3 in Boca Raton Bowl, giving the Owls 10 consecutive wins and their first 11-win season at the FBS level. 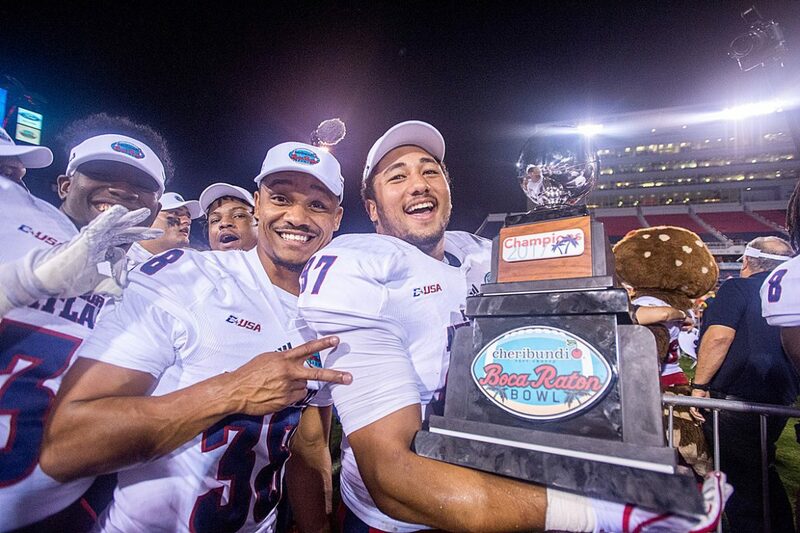 The Owls past three games in Boca Raton ended with first-year coach Kiffin and his players hosting the Shula Bowl trophy after beating FIU, the Conference USA trophy and now the Boca Raton Bowl hardware. In all three games the destination of those prizes had been determined long before the final whistle. With the win the Owls remained perfect at 4-0 in postseason games at the FBS level – three bowl wins and this year’s Conference USA championship. The bowl victory is their first since 2008. Quarterback Jason Driskel threw for 270 yards on 19-25 passing and four total touchdowns, earning offensive MVP honors. With two passing touchdowns Driskel moved into fifth in the all-time passing touchdown list with 27. “Driskel threw the ball really well today,” FAU coach Lane Kiffin said. Running Back Devin Singletary also added to his record season with three more touchdown runs, giving him 32 on the season. His first score, a six-yard run seconds before the close of the second quarter, broke a tie with position coach Kevin Smith for most rushing TDs in a Conference USA season. “This many touchdowns, I don’t know if I saw that coming,” Singletary said. Singletary finished with 124 yards, 80 shy of 2,000 on the season, and now has more rushing touchdowns than 114 FBS teams. 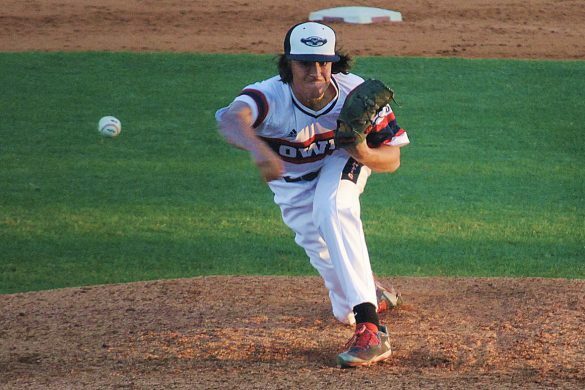 But that’s about the only area the Owls came up short. Six times FAU ran a fourth down play. Twice they converted those plays into first downs. Three times the Owls scored touchdowns. Only once, the final fourth down conversion attempt of the night, did FAU fail to convert. Driskel starting the scoring by finding freshman Willie Wright for a four-yard touchdown on fourth-and-goal in the first quarter. A failed onside kick and two FAU penalties allowed Akron to post it’s only points of the game on the following possession – a 19-yard field goal by Nick Gasser to make it 7-3. FAU’s defense locked Akron down from there, holding the Zips to 146 total yards – and only 42 in the second half. The Owls outscored the Zips 29-0 over the final 30 minutes. 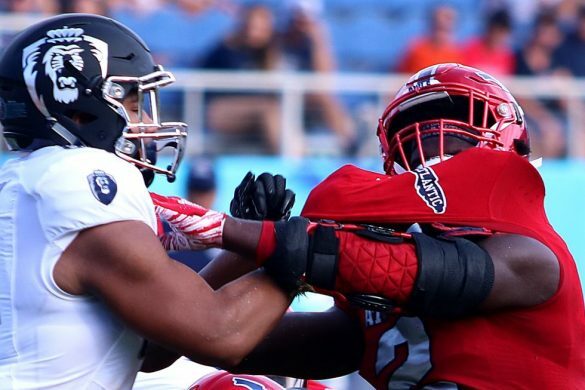 Boca Raton Bowl Defensive MVP Azeez Al-Shaair led the Owls with 13 tackles, including a sack. 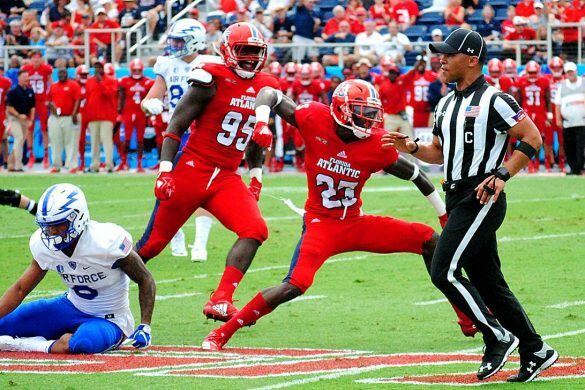 Al-Shaair passed Frantz Joseph as FAU’s career tackling leader with 354. In the locker room following the game the junior told his teammates he’d forego a chance at the NFL to return for a senior season. 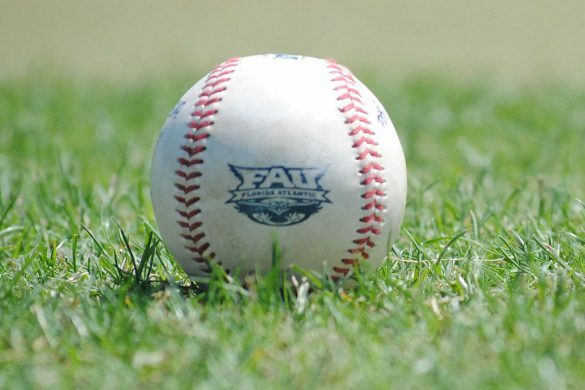 FAU completes the season at 11-3, tying a program record for most wins. The 2003 team that reached the FCS semifinal game also won 11. FAU will now have to wait until after the college football playoff to learn whether they will end the season ranked in the Top 25 in either the AP or the coaches’ poll. The Owls had been receiving votes in both the final polls before bowl season. 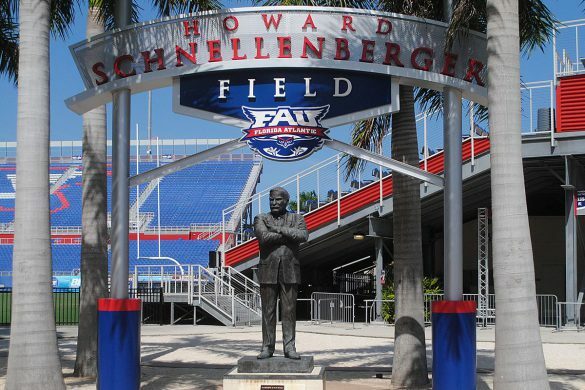 BOCA RATON – Lane Kiffin accomplished in three-quarters of a season what no single coach at FAU has been able to do since program founder Howard Schnellenberger last did it in 2008. 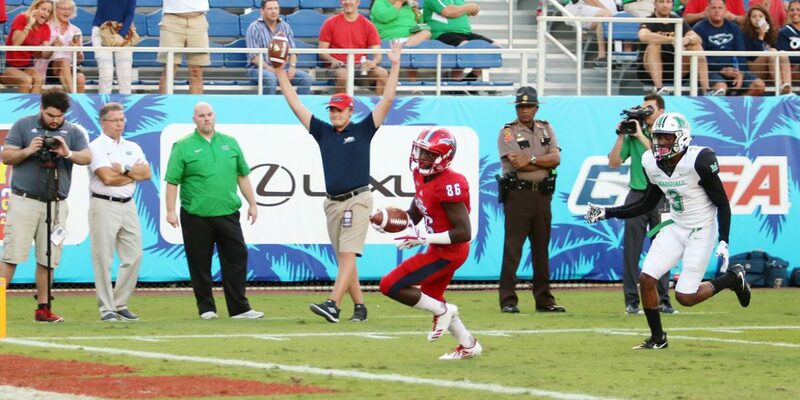 Nine games into the Kiffin era, FAU is bowl eligible. The Owls won their sixth game of the season on Friday night, hanging on to beat Marshall 30-25 to take control of the Conference USA’s East Division. FAU won bowl games in 2007 and 2008, but hasn’t been to a bowl since. The Owls were last bowl eligible in 2013 when Carl Pelini led FAU to two wins before interim coach Brian Wright piloted the Owls to four consecutive wins to end the season. The Owls were bowl eligible but did not receive a berth. To earn bowl eligibility on Friday the Owls needed to slow a Thundering Herd squad that two weeks ago was 6-1 and widely considered Conference USA’s best team. 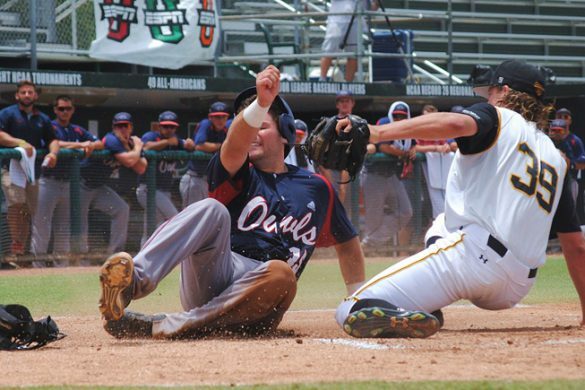 Now the Owls hold a two-game advantage over Marshall plus own the tiebreaker with only three games remaining. 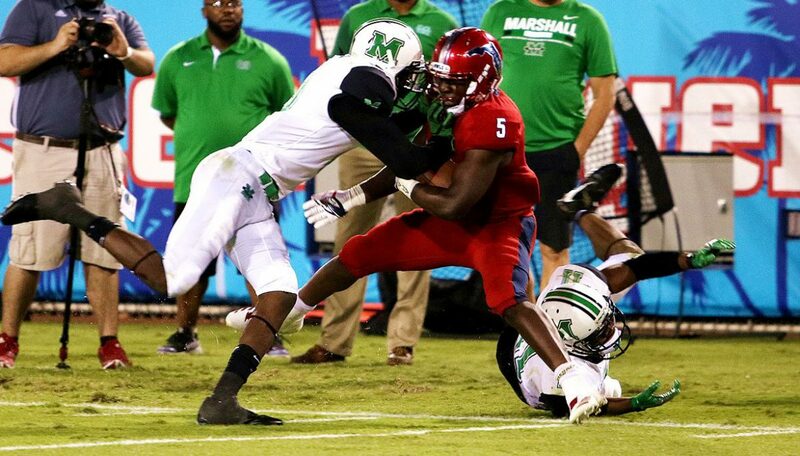 Prior to Friday night FAU (6-3, 5-0) had never beaten Marshall (6-3, 3-2) in four tries. The Owls finally broke through by following the same formula that allowed them to enter the showdown riding a four game winning streak – give the ball to running back Devin Singletary and let the defense get the ball back. Conference USA’s reigning Offensive Player of the Week, Singletary darted his way to his second-consecutive 200-yard rushing evening. 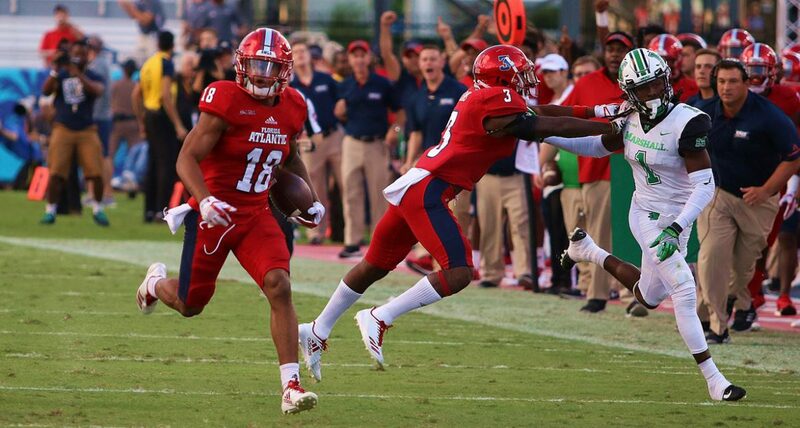 He only found the end zone once on the ground, but the back nicknamed “Motor” caught a nifty 60-yard touchdown on a double pass from wide receiver Kamrin Solomon that snatched momentum back for FAU moments after Marshall tied the game at 16 with 13 consecutive points to start the second half. No one appreciated the play more than Driskel. Young’s second interception of the night came early in the fourth quarter, setting up Singletary’s 13-yard touchdown run. 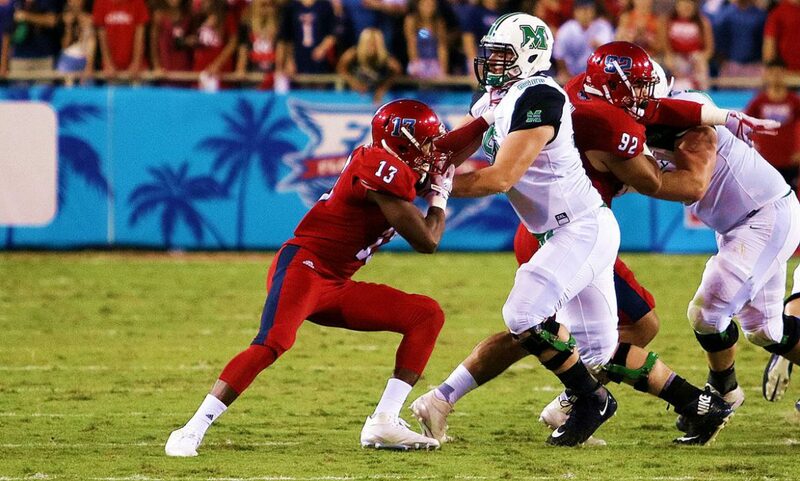 Leading 30-16, FAU struggled to put Marshall away. 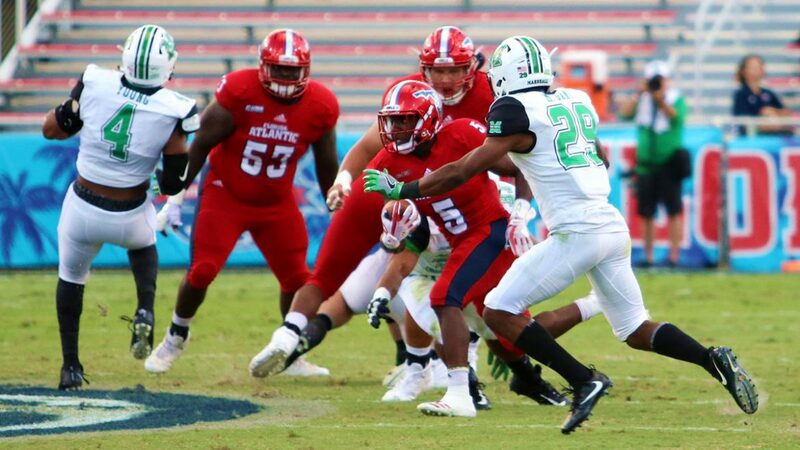 The Thundering Herd responded with a 14-play, 75-yard touchdown drive that cut FAU’s lead to 30-23 with 5:21 remaining. The Owls picked up a first down on the ensuing drive and forced Marshall to use all three of its timeouts before punting the ball back to the Herd. Four plays later Young hauled in his program record-tying third interception of the night, all but sealing the victory with 2:30 remaining. FAU miscalculated the amount of time it could run off the clock and called for quarterback Jason Driskel to take a knee on the first play. “They told me to go out there and take a knee and I went out there and took the best knee I could,” Driskel said. After realizing they couldn’t burn all the clock, the Owls told punter Ryan Rickel run around in the offensive backfield on fourth down before racing to the back of the end zone and taking a safety. FAU squib-kicked to Marshall with 8 seconds remaining. Using laterals the Herd made it all the way across the field to one sideline, then back to the other before finally being swarmed under, ending the game. The Owls are now 5-0 in conference play for the first time ever, and will hold at least a one-game lead over FIU heading into next week’s game at Louisiana Tech. TALKING POINTS: Marshall scored the first 13 points of the second half and owned all the momentum when the Owls called for a double pass. Wide receiver Karmin Solomon caught the Jason Driskel toss, then heaved it down field to a wide open Devin Singletary, who eased into the end zone. The touchdown put FAU up 23-16 and the Owls never trailed again. Can anyone stop Devin Singletary? Motor rushed for 203 yards and one score. He also caught a 60-yard touchdown. 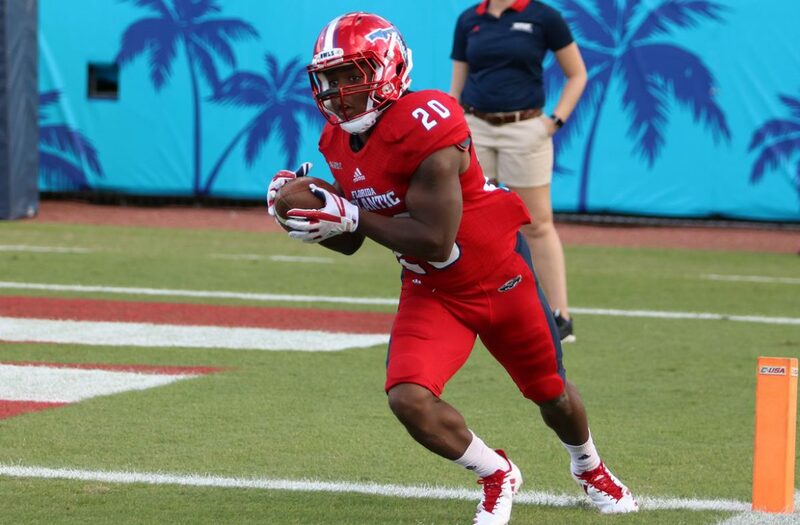 FAU barely gave him the ball early in the season, but now he’s rushed for 100 yards in seven consecutive games. The 1,256 rushing yards he’s amassed thus far is the second-most ever by an Owl, and he should pass Alfred Morris next week. Only a sophomore, Singletary keeps getting better. Safety Jalen Young vaulted to the team interception lead, his three picks on the night giving him five for the year. Corners Shelton Lewis and Chris Tooley are close behind with four. As a team the Owls now have 18 interceptions, one off the program’s high for a season. In nine games, Lane Kiffin has six wins. That matches the Owls’s win totals for the past two seasons combined. 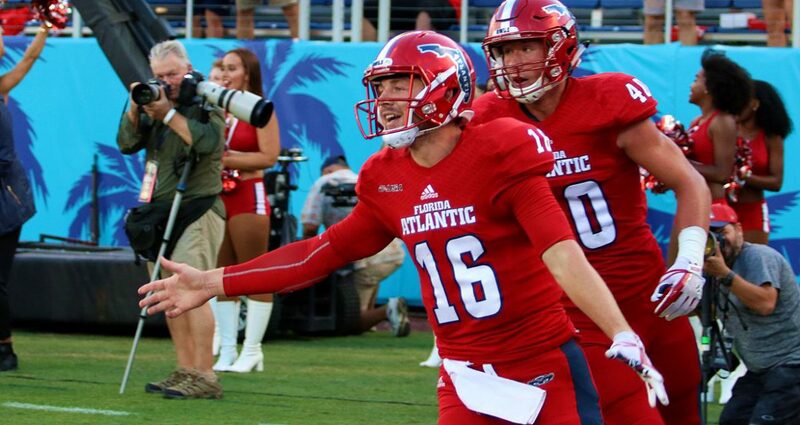 If FAU can reach the Conference USA championship game, which now seems likely, and a bowl game, which seems all but certain, Kiffin could match or surpass previous coach Charlie Partridge’s three-year win total of nine, doing so in a single season. Special Teams weren’t all that special for the Owls. Greg Joseph missed an extra point and Marshall pulled off a surprise onside kick. 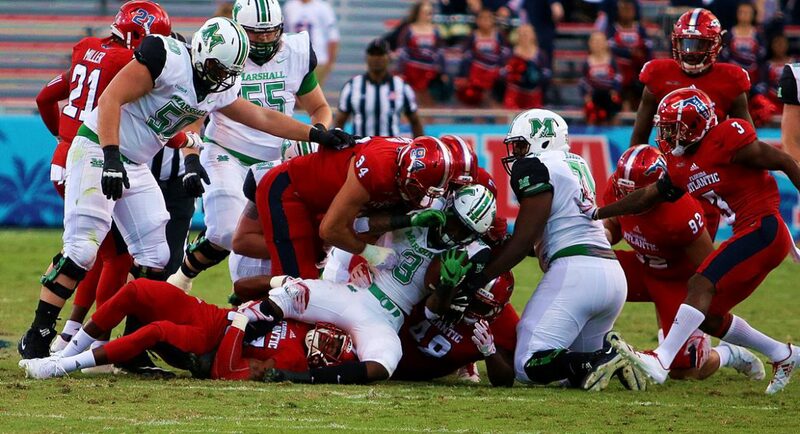 Fortunately for FAU, Marshall experienced its struggles, too, missing an extra point and a field goal. 3 – Pass break-ups and an interception credited to Shelton Lewis, who rebounded from a tough game at WKU with a stellar effort on Saturday. 4 – Ryan Rickel punts. All four were downed inside the 20. 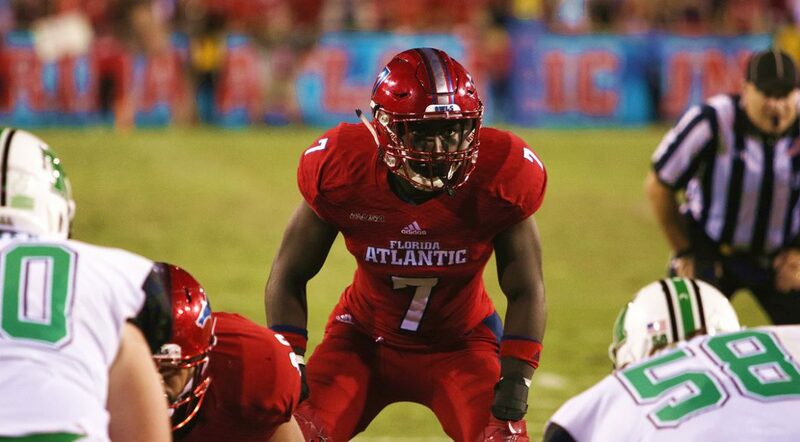 13 – Tackles for FAU LB Azeez Al-Shaair, most in the game. 16 – Points off turnovers for FAU. The Owls’s offense didn’t turn the ball over. 60 – Passing yards for FAU WR Kamrin Solomon. 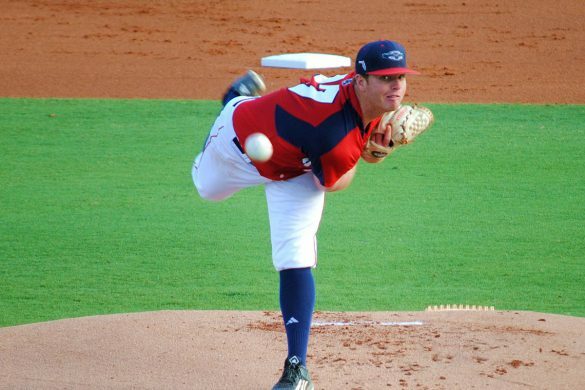 FAU QB Jason Driskel only managed 104. 15,880 – Announced attendance for the game. The actual attendance appeared much lower. UP NEXT: FAU gets an extra day of rest before hitting the road to play Louisiana Tech on Saturday.